All American Wood Register Co. was born in 1972, an outgrowth of president Tom Stasiak’s small millworking shop. He explains the reason for their longevity in a sometimes volatile market. “The onset of high technology has allowed others to make similar products that might look like ours, but those products aren’t as well engineered, so can’t perform as well. My history as a restorer of old machining equipment has given me the ability to adapt existing machines and to design and fabricate original equipment to perform milling processes our competitors can’t touch. “It’s not just our unique products, but also being innovative and listening to our customers that have kept us an industry leader. In response to suggestions from some of our trade customers, we’ve made changes in our product designs and service processes over the years. “For instance, we pioneered grooved frames on our flush registers to accept the tongues or splines of hardwood and laminate flooring. This allows the registers to not just sit in the floor, but to become a sturdy, integral part of it. We also recessed our damper control to make sanding easier for installers, and to eliminate the end-user hazard of stepping on a raised thumbwheel. We stock registers in more than sixty species of wood. 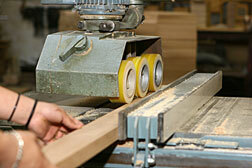 It takes experienced craftsmen to know how to mill all kinds of lumber in a way that gets the most out of each piece. And we need to do that to continue offering affordable products to our customers. Tens of thousands of registers are in our warehouse at any given time, to maintain our same-day shipping tradition. We can ship most custom registers within 48 hours. 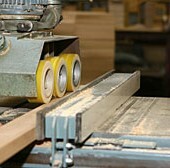 We manufacture both the wood grille and metal damper parts in house. We’re proud of our ability to offer unparalleled customer service in an era where personalized attention is becoming a thing of the past. We’ve learned how to embrace the wonders of new technology without throwing out what’s pleasant and effective about traditional business practices. From oak and maple to exotic woods such as purple heart and ebony; from wall and ceiling registers to illuminated stair risers and custom wood mouldings, All American Wood Register Co. offers dealers, contractors and do-it-yourselfers a wide range of choices to fulfill unique interior finishing needs.